Photos from day two of my cross-country drive. 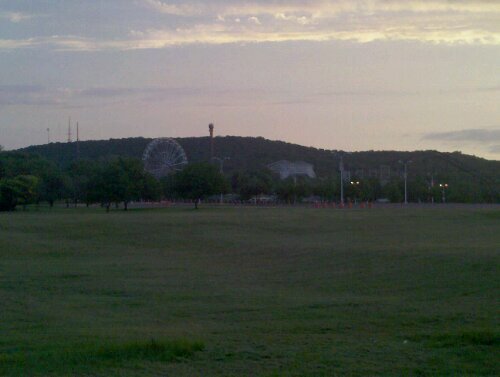 June 15 began with a morning run from the campground to Six Flags and back, and ended in Arkansas. 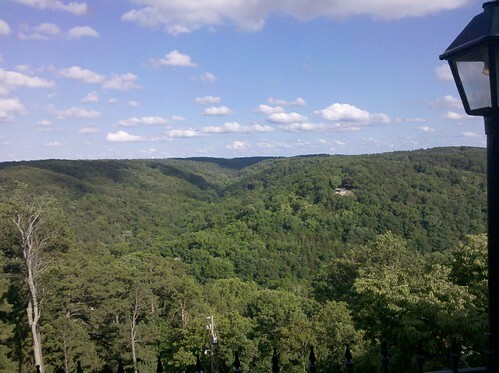 View from the Crescent Hotel in Eureka Springs. Click the photo for the entire June 15 set. One more from the road. 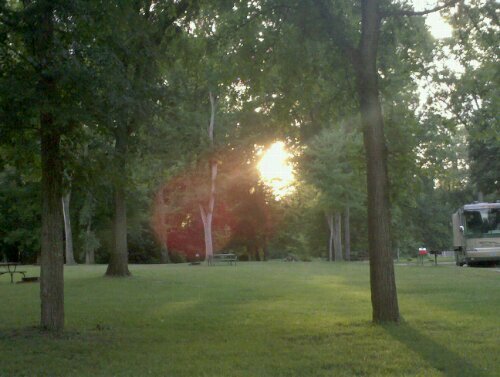 It’s humid, but the day is cooling nicely, and the sun is already behind the trees. The insects and birds are noisier (in a good, summery way) than they were my first time through, and I am digging the cicada song from the trees. No rain in the forecast, either. Today’s drive pushed 12 hours total, since I took a long lunch break to rest and write. The eastern part of Kansas passed quickly, marked by passage through Topeka and near Lawrence, and with the aid of a few podcasts, and then the twists and turns and traffic and cityscape of Kansas City kept things interesting – so much so that I failed to notice when I had passed into Missouri. Once I got through the metro area, though, I realized that something was missing. I had passed large portions of this trip without radio or podcast company, finding myself kept more than alert by the changing surroundings and new roads. 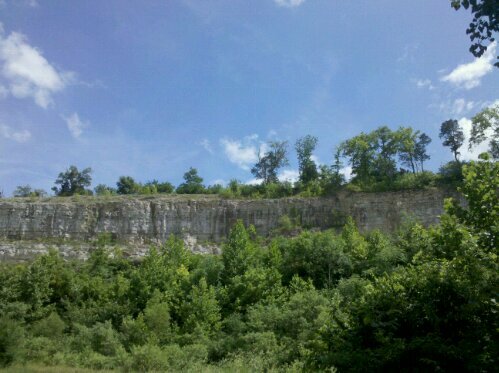 Here in western Missouri, though, even though it had been 10 years since I’d driven this highway and it should have felt “new,” I wasn’t drawn into the environment; wasn’t exploring it with my eyes; wasn’t soaking it all in – and I couldn’t figure out why. Then it hit me: It was too familiar. The woods at the roadside were the same leafy, deciduous variety (at least in appearance) as those in Ohio. the hills rolled similarly, and the horizons were closer, and even the biggest corn and soybean fields felt cozy in comparison to their sprawling brothers further west. 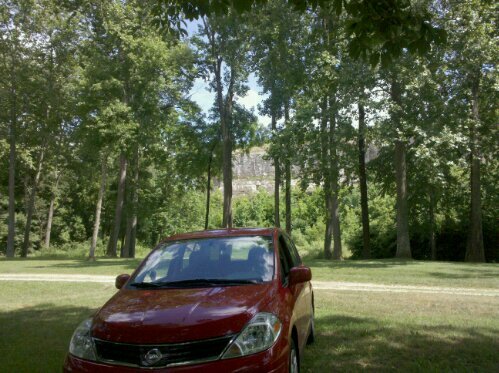 Yes, there differences, especially in things like the massive bluffs along the eastern bank of the Missouri River, but for the most part, the scenery along the Interstate could have been any number of places I’ve driven in Ohio. I did have one remaining “untraveled” stretch of road to enjoy, exiting at Warrenton and heading down Missouri 47 and then 100 before hooking up again with I-44, which I drove on the westbound leg. While I spent too much of this winding, two-lane drive staring at the back end of an RV towing a car, I did get to traverse the Missouri River over a long, narrow, steel-girdered bridge that I would love to have photographed were it not for the lines of steady traffic in both directions. And there’s this fun little geographical quirk of my route today, too: I crossed the Missouri River TWICE today, from one bank to the other and then back again – so yes, here at the campground, I’m on the same side of the river as I was in Kansas City – but I WON’T be crossing it again on the way home. I find myself thinking of other little things I hope not to forget: The sight of a little snake wriggling its way across a sizzling blacktop southwest of Timpas, Colorado; the way that it felt when I was in western Kansas and I realized the Iowa plates on my rental car didn’t seem quite as out-of-place anymore; the head-high flight of a yellow crop duster looping and diving over the fields in a buttery-sun morning. And, of course, every single day of this trip came with just bucketloads of awesome, one after the other after the other, and now, I’m sitting here watching the setting sun bathe bluffs and trees in green and baked-bread gold, and the campground smells like wood smoke and bug spray and summer vacation, and I can hear a train rumbling past somewhere and I’m going to wrap this up and walk around and drink it in until I’m tired and it gets dark enough to crawl into my tent. 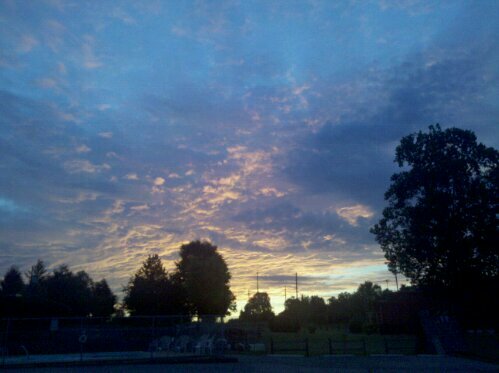 Tuesday, June 29, 3:50 a.m. This is the earliest I’ve gotten up during the entire trip, but I know I’ve got to give back one more hour today, and I went to bed well before full dark last night. It’s been a long time since I’ve ready Travels with Charley, but I seem to remember that towards the end, Steinbeck wrote something to the effect of having a realization that though he was on the road, his journey had ended and he was now simply on his way home. I get that feeling this morning, and while I don’t want to take this last leg for granted or find it slipping past unnoticed, I’m ready to be home again. There’s a lot in my head yet about what this trip has meant to me, but now’s not the time to write it. I’ve got a few hundred more miles to go.